How d!d the Kn!gnt surv!ve ?? A dragon and a knight live on an island. There are seven poisoned wells on the island.These wells are numbered from 1 to 7. If someone drinks from a well, he can only neutralize the poison by drinking from a higher-numbered well. Well number 7 is located at the top of a very high mountain on the island and only the dragon can reach it. 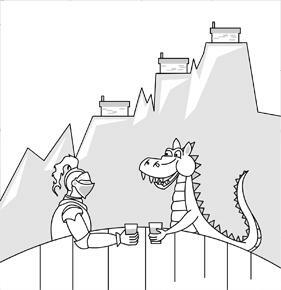 One day the dragon told the knight that he wanted the island all for himself and that they should have a duel. He set the foll owing conditions. Each of them has to bring a glass of water to the duel. Then,they are supposed to exchange the glasses, and drink from the other’s glass. The dragon thought that the knight was doomed to die. But the knight devised a clever plan so that he will live and the dragon will die. What was his plan?